From the kitchen of One Perfect Bite...He was an old man. He survived two wars, one left him with a gimpy leg, the other with a numeric tattoo. He rarely spoke of either. He came, without family, to the United States in the late 40's. He opened a small shop, called Jack's, where he sold convenience items and made breakfast and lunch for the neighborhood. The store was positioned on a street that served as an artificial barrier between neighbors in Montclair. While it was one of the first integrated communities in the country, there were areas of the town that seemed to be separated by color. In truth, the barriers were economic, rather than racial. Flanked by palaces on his right and bungalows and apartments on his left, Jack served coffee to all and was incredibly good with the neighborhood children. No child within his reach went to school hungry and it was not unusual to see a child spinning on a stool next to a Senator or ball player who was trying to read the morning paper. The shop was also a mecca for editors and writers who commuted to their jobs at The New York Times. There were so many of them that locals, had if fact, named a stretch of the town the Times Ghetto. Jack rarely smiled but there came a Monday when he beamed for most of the day. The Sunday New York Times Magazine had, in an article, named his egg cream the best in New Jersey. I learned today that Jack had passed. I will, of course, say my prayers for the dead, but he was not a religious man and would smile at my foolishness. I wanted to mark his passing in a way that would please him. I remembered the article and his smile that day. Now, my egg cream will never be a match for his, but wherever he is, he'll know I'm thinking of him. L'chaim, Jack. Shalom. 1) Pour 1 inch of U-Bet syrup into a soda or cola glass. 2) Gently pour 1-1/2 inches of milk on top of syrup. 3) Fill glass with seltzer or club soda and leave some room at top so it doesn't overflow. 4) Stir vigorously to get most of the chocolate from the bottom and sides of glass. 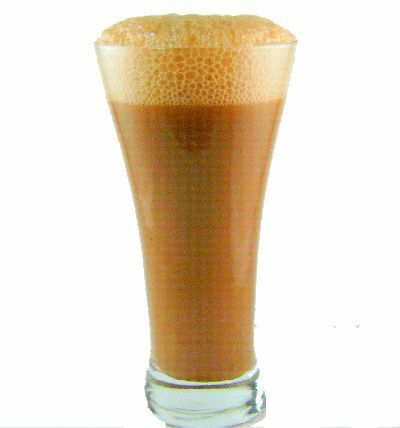 Egg cream should have 1 to 2 inches of foam at top. Serve immediately.